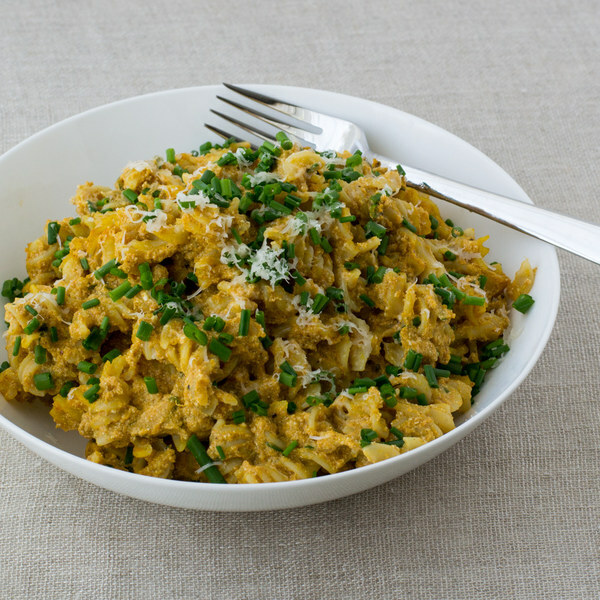 ← Pumpkin & Ricotta Pasta Bake with Parmesan & Chives. Fill a large pot halfway with water, cover, and bring to a boil. Uncover, add salt and pasta, and stir for a few seconds. Cook until desired firmness, 8-10 minutes. Heat a sauté pan over medium-low heat. Coat bottom of pan with oil. Add garlic, sage, and thyme. Cook until fragrant, 15-30 seconds. Add broth, pumpkin, ricotta, salt, and pepper. Stir to combine. Simmer, stirring occasionally, while pasta is cooking. Preheat oven to broil and position rack 4 inches under the broiler. Wash and chop chives into small pieces. Grate ½ cup of Parmesan. Add ½ of the chives and Parmesan (save the rest for garnishing) to pan and stir to combine. Drain pasta, add to pan with sauce, and stir to combine. Place pan in the oven and broil until slightly browned, 3-4 minutes. To serve, place pasta on a plate and garnish with remaining chives and Parmesan. Enjoy!